The Total Buy Ins – This group of people get swept up in the hallmark ideals of Valentine’s day and feel the need to out do themselves every year with bigger and better presents. They don’t worry about the inflated price of roses, big and gaudy cards and cuddly toys are a minimum. Scarily I’m also seeing adverts for things like IPads as Valentine’s Day gifts, which to me is just way over the top. I mean surely a “token” of your love should not cost £350 +? Truth be told this group is normally either the fairly young or those in relationships (often fairly new) who haven’t quite left the rose tinted glasses behind them. The Total Buy Outs - This group are the bah humbugs of Valentine’s special day. They don’t believe in it, won’t support it in any way and generally poke fun out of anyone that celebrates the day in any shape or form. They are often disillusioned with every other holiday such as Mother’s Day, Father’s Day and of course Christmas, having lost any innocence or childlike wonder some time ago. A fair few of them are likely to be single, survivors of past relationships or in one that isn’t making them happy and fulfilled. The Wannabes – This group is for those that would normally be in the Total Buy ins, but due to a lack of current love interest find themselves unable to enter into the holiday they love with the same spirit. In fact quite the opposite the holiday can make them more depressed at their seeming failure because they haven’t attained a spiritual oneness with another person. They desperately yearn for a secret admirer and are crest fallen when no card or flowers land on their door come 14 Feb. Sadly this group can also be those that become the Buy outs, there expectations never having been met, they give up on the idea of Valentine’s altogether. The Share A Tokens -This group neither loves, nor loathes the holiday and they treat it as an opportunity to just remind a loved one (not necessarily your significant other) that they are loved and cared for. No grand gestures required, but no bah humbugs either. A nice personal little card, maybe a back rub or some personal vouchers, e.g. for breakfast in bed. Basically something that shows you care without going over the top. There may be a meal and some flowers involved, but on the whole they don’t go into debt up to their eyeballs to fund it! I like to think I fit into the latter group of people. Whilst I think it’s nice to have a day that celebrates love and lovers, I don’t agree with the commercialisation of it that leads to such high expectations. I read somewhere (last year) that a young lad committed suicide because he didn’t know what to get the girl he was seeing for Valentine’s Day and was afraid she’d dump him for it and couldn’t face it. Obviously he had bigger problems going on, but it highlights a growing trend in our society that more is more and if it were a word morer would be best. I think it’s important to remember that it is just a day and that if you love someone, every day is an opportunity to prove to them how much you love and care for them. Cliché it may be, but then it is a fundamental truth that we all know if we take a moment to look beyond the modern voracious need to consume, covet and own that there is more to love than electronic goods, holidays, champagne, flowers, chocolates and cuddly toys. You don’t need the material things or even the hallmark card, you just need to show it in a way that make sense to you and to the person(s) you want to demonstrate it to. Because when someone withdraws the little touches of affection, fails to say they love you in deeds or words, it is these that you miss, that cut a hole in your chest where your heart belongs. Gifts can be easily forgotten, but memories, the very best of them, are for life. This year Ben got a home made Wealie original card (not so strange as I tend to make all my cards), but also including a Wealie original piece of art (the heart design above at the beginning of the article) and a few heartfelt words, plus plenty of love and hugs. I’m getting a massage and Beef Stew and dumplings. I can think of no better way to spend my Valentine’s Day, though I could do without the cold, I’ve got! To all of my friends and loved one though I would also like to share a bit of extra love with you today, to let you know that there is space in my heart for you too. I hope that wherever you are, whatever you’re doing, whomever you are with, that you are loved, valued and special. Below is my Wealie Valentine’s blessing. Why don’t you take a moment to give someone your Valentine’s blessing and give the gift of a memory that lasts a lifetime for them and you. Now knowing this true, hold dear the knowledge that loved are you! Dedicated to all my dear friends, whose love buoys me when life threatens to sink. 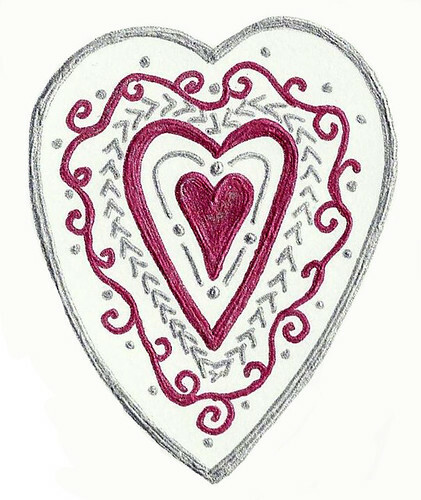 This entry was posted in Doodles, My Blog, Poetry and Prose and tagged abstract art, art, heart, love heart, pen and ink, poem, poetic, poetry, ruth weal, Valentine's Day, wealie. Bookmark the permalink.